Connecting Threads is on a mission to inspire our customers to create beautiful things with our fabric, thread, needles, tools, patterns, and books. We go right to the source and work directly with trusted mills and manufacturers around the world. Our hands-on approach from start to finish gives us the freedom to make the fabric and thread our customers want without ever sacrificing quality. Our loyal and dedicated online crafting community is a big part of our success. Now we invite you to join us with our Affiliate Program. Are you a crafter that loves to blog and share your passion for quilting or sewing through social media? Upon approval, our Affiliate Program allows participating websites to earn commissions on sales referred to Connecting Threads using specially tracked links. We provide you with custom links and banners that you can post on your website or blog. 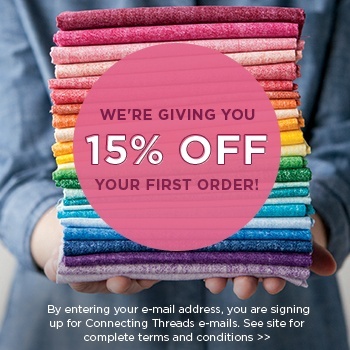 When a visitor you’ve referred to us makes a purchase on Connecting Threads you'll earn 10% of the sale. And if the visitor is a new Connecting Threads customer, you'll receive 30%! 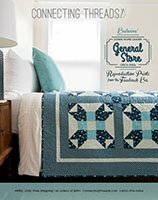 Signing up for our program is completely free through our affiliate host ShareASale and you'll be welcome to choose whichever product you would like to feature - for example, if you are sewing up a quilt in Quilter’s Candy Basics, you can use the special link to the Quilter’s Candy Basics page to earn a commission! You can also advertise Connecting Threads by posting special ads, banners, or other images, all provided and easy to upload to your site. Sign up by clicking the link below. This will take you to our affiliate program page on the ShareASale site. Fill out the easy application and it will be reviewed within 48 business hours to help you get started right away!